The Netherlands – ELC Lighting bv, manufacturer of the innovative, multi-award winning Ethernet-based digital intercom system for event production and broadcast applications, has announced the appointment of two new distributors. These latest appointments bring the brand’s global sales network total to 39 countries, as Green-GO continues to increase its market presence worldwide. The new exclusive distributor for Green-GO in Slovenia is MK Light Sound d.o.o., based in Ljubljana. The long-established and highly respected company provides top-end lighting, audio and multimedia equipment and systems as well as consultancy, engineering, installation and technical event production services. 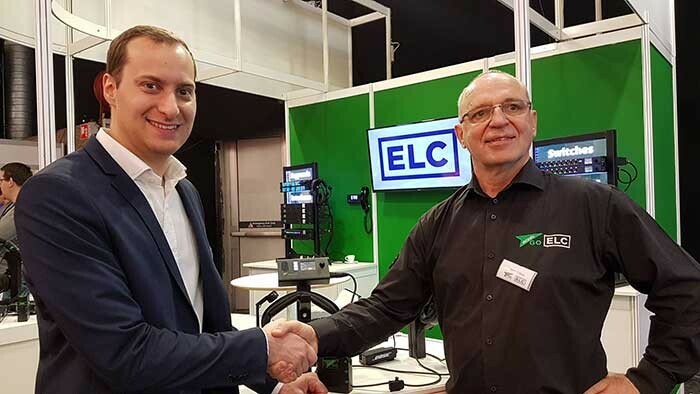 In Thailand, Bangkok-based Broadcast Audio Service Ltd becomes the exclusive Green-Go distributor. A systems design and integration specialist founded in 2008, the company provides equipment and services to all major Thai broadcasting organisations. With wide-ranging experience in the implementation of broadcast control systems, Broadcast Audio Service is a leading player and a reliable partner for the Thai broadcast market. Further additions to the Green-GO global sales network are expected to be announced in the near future. In picture: Dean Karov of MK Light Sound shakes hands on the deal with Silvio Cibien of Green-GO.